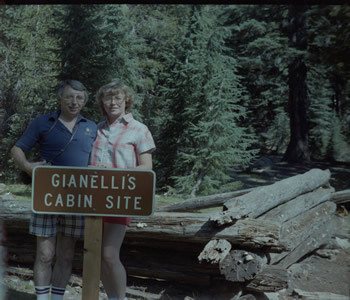 Until recently the trailhead to Burst Rock, Powell Lake and Chewing Gum Lake began at the site of Gianelli's Cabin, but the trailhead has been moved a short distance away to the left of the far parking lot. This is the sign that welcomes the hiker today. 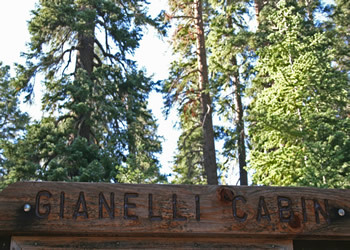 To reach what was once Gianelli's Cabin, there is a narrow trail starting at the right side of the far parking area. 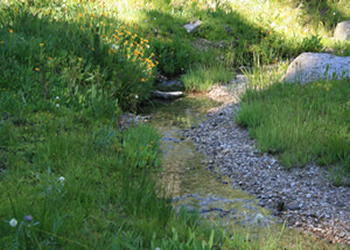 You will walk through a small, but lovely meadow with an abundance of wildflowers and come to a small stream which is upper Cow Creek. 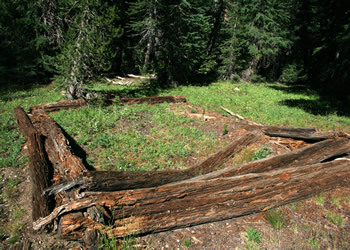 After crossing the stream, you will see the remnants of the cabin. Baneberry is one of many wildflowers in the meadow. It grows in damp woody areas and along streams and creeks. 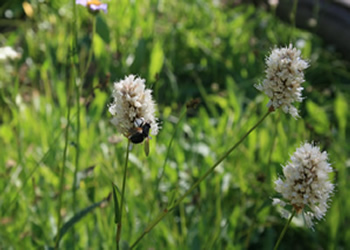 The blooming period is between May and July and grows in height from 1 to 3 feet. It has bright red (or white) berries later in the fall which are poisonous. This flower looks much like Bear Grass that is so prevalent in Glacier National Park. Obviously, the sign is no longer there...and unless a person knew where to look, one would not know where the cabin was located. This is what part of my Web site is about ...what there is to see in the Stanislaus, where it is, and how to get there...and most importantly, preserving history. From the Summit Ranger Station, turn left onto Pinecrest Lake Road and drive a short distance to Dodge Ridge Road. Make a right turn and continue to the Forest Road 4N06Y (about 2.9 miles). This is where you reach the entrance to Dodge Ridge Ski Resort. Make a right turn at this point and then turn left when you reach 4N26. Continue toward Aspen Meadow and the Pack Station. Drive past the pack station for about 6.5 miles to the trailhead. This is a popular trail leading to Burst Rock and beyond for both backpackers and equestrians and the parking is usually difficult on weekends throughout the summer. Another way is to turn onto Crabtree Road (4N26) from Highway 108 just shortly after leaving Cold Springs heading east. Remain on this road and upon reaching the Pack Station, continue as mentioned above. Shortly beyond the Pack Station the pavement ends. Once again, I recommend high-clearance vehicles ...although many conventional cars have made the drive. One would have to drive around rocks and potholes. © Copyright 2011 - Images by Adelaide - All Rights Reserved.